'Christ and the Chocolaterie' is the original, innovative and lively Lent course based on the story and characters of the Oscar nominated 'Chocolat' from the bestselling novel by Joanne Harris. Using the Oscar nominated movie 'Chocolat' as its starting point, Hilary Brand explores questions about God, the world, and what it means to be as truly human as God intended. Giving up - the prelude to change. Giving out - the power of a gift to change. Getting wise - accepting the possibility of change. Getting real - the power of acceptance. Growing up - the process of real life change. Each section refers to scenes from the film, questions to start discussion, practical exercises and meditations. Each weekly session leads into suggestions for individual reading, meditation and further Bible study. As conclusion to Lent, Easter is celebrated with ideas for a chocolate feast and a chapter on its curious history. Not forgetting the need for life change on a global scale, Hilary Brand doesn?t shy away from revealing the unfair economics of the chocolate trade and its consequences. HILARY BRAND is a freelance writer of novels and devotionals for children, young teens and adults. Specialising in applying the power of visual imagery to explorations of faith her books include 'Art and Soul'; co-written with Adrienne Chaplin (Piquant), 'A Sceptic's Guide to Reading the Bible' (BRF) and 'What Am I Doing Here'; with cartoonist Dave Walker. Her 2012 Lent course 'Finding a Voice' is based on the award winning movie 'The King's Speech'. Christ and the Chocolaterie and Chocolat DVD Value Pack by Hilary Brand was published by Eden bundles in January 2016 and is our 4134th best seller. The ISBN for Christ and the Chocolaterie and Chocolat DVD Value Pack is EDENBUNDLE-1707. 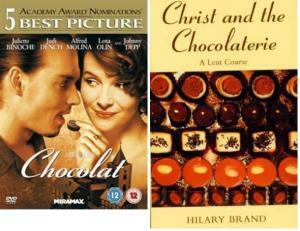 Be the first to review Christ and the Chocolaterie and Chocolat DVD Value Pack! Got a question? No problem! Just click here to ask us about Christ and the Chocolaterie and Chocolat DVD Value Pack.